We can thank the Swedish for Ikea, a culture of afternoon coffee and sweets, and a new neighbourhood movement called, ‘plogging.’ Plogging is a combo of the word ‘jogga’ (jog) and ‘plocka upp’ (pick up). Together, plogging is the activity of jogging and picking up garbage as you go. Joggers around the world are getting in on the trend, by why? Joggers in Sweden found that everyday they were running by the same pieces of litter and they decided to start a new movement. Instead of running past trash, they would run with a bag and pick it up. The act of stopping and starting, and of squatting down, is not seen as a hindrance to exercise, but a benefit. But even more than that, a handful of ‘ploggers’ can make a serious difference in how clean a neighbourhood can become. It has created a culture of pride and strengthened the bonds of community. As the ice and snow is melting, we get a chance to see the accumulation of winter trash around Chestermere. From plastic cups to debris strewn along fence lines, we find that we make a lot of waste. According to the Conference Board of Canada in 2013, the average Canadian produces the largest amount of waste of the leading 17 developed nations, at 777 kilograms per person per year, twice that of Japan. While we are also rapidly developing systems to recycle and compost, some of that waste accidentally makes its way into our neighbourhoods. 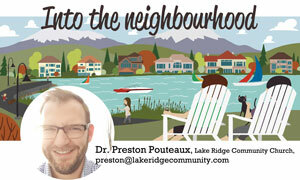 In our city we are grateful for community service groups, the City of Chestermere, and churches who organize clean up days, but it really comes down to the hands-on ambition of local neighbours to bend down and pick up trash. I ran into my neighbour Rob as he was out walking and picking up garbage (he coined the clever word, Pulaking) with a trash bag in hand. When I asked him why he would take the time to carry a trash bag on his evening walk, he said, “really, I hope to meet more neighbours, many, many more. I figure getting in my step count while doing laps in my neighbourhood and picking up trash was a reasonable way to accomplish something good. As well, seeing the detritus left after the snow melt gave me motivation. Maybe some inspiration to others as well.” It’s true, other neighbours are getting in on the cleaning. It was no effort at all for a group of us to clean up down our alley, and we had a laugh doing it. There is something more happening here, I believe. When we slow down to pick up trash that was made by others, we are not losing anything of ourselves to do so. We do not become lesser people, we become more. When we serve our neighbourhood and clean it up, we are really serving and, in a way, loving our neighbours. We are proud to say that it is not beneath us to keep our place clean. While we might not be pleased to touch others’ trash, we know that very likely trash we’ve produced is being cleaned up by people we may or may not know. Who would have thought that there could be such sense of mutual care in the simple act of picking up garbage on our street or in our neighbourhood. Whether you’re open to ‘plogging’ or ‘pulaking’ (thanks to the Swedes and my neighbour Rob for these great words), may you know the joy the caring for your neighbours by caring for your place. When even a few of us join in to bend down and pick up trash, we build a better community for everyone.